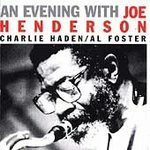 This album is one of the greatest saxophone/jazz/MUSIC albums ever made, simply catching Joe Henderson, Charlie Haden & Al Foster in concert one day in Italy 1987. This was a one-off concert, was done with no rehearsal, and the result documents what jazz can be when it is at it's best. Joe's amazing sense of architecture, his original harmonic approach, his funkiness, ability to go in & out as well as his overwhelming originality and depth of emotion is at full display here. He is simply one of the greatest saxplayers ever! And Charlie Haden & Al Foster are themselves delivering truly inspiring performances. From a technical perspective the album is not a "slick" production, like some of the later Verve albums. However, this one really captures Joe Henderson's great tone on his instrument, and the basssound is also well recorded. The drumsound is probably not quite what it should be, but Al Foster plays so great it makes you forget. John Scofield has called this album his "bible". When you listen to it you'll know why! It is up there with anything John Coltrane or Sonny Rollins has done.